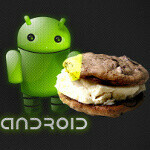 Ex-Google CEO Eric Schmidt spoke at MWC and virtually confirmed that Ice Cream (Sandwich) is to incorporate some Honeycomb features when it's officially released. "Today I’ll use the commonly used names. We have OS called Gingerbread for phones, we have an OS being previewed now for tablets called Honeycomb. The two of them… you can imagine the follow up will start with an I, be named after dessert, and will combine these two." This news is in accordance with previous rumours, but there is no official timeframe when Ice Cream will be released (even a Honeycomb-powered device is not launched yet) or what version of Android it will be, although Schimdt noted that "we will be seeing a 6-month OS refresh cycle." This is not something the Mountain View-based company is eager to discuss, but do you think this may be Google's answer to all these critics that claim fragmentation is killing Android - by creating a universal version for both tablets and smartphones? Or Ice Cream will be a smartphone-only version of Android? Tell us with your comments. I think Google needs to slow down on kicking out a new update every quarter and focus on getting all of the current handsets caught up, or at least get the OS's available for them (Obviously it's up to the customers to ultimately update them) I'm in the same boat as most of the critics; there's way too much fragmentation across the lineup. I as a developer see no problem with Google's 6 month refresh process. Hell, I would be happier if they had a three month process. Job security and more features every couple of months makes my life easier. Now as a consumer this doesnt work well for me. Since the OS must be adopted by the manufacturer and then the manufacturer will probably want to layer over their own interface and then the carrier will be like we need to test this for a year to five years. It becomes a problem that I can actually every use the new technology or by the time the new OS hits the market it is already old. What I would like to see Google say is that the OS of whatever phone you have will automatically update from Google and the not the carrier or the manufacturer. A core OS where the interface is an add-on by the manufacturer. It would be like running Windows on any PC. Windows updates itself, you can even install new versions of windows on the PC, and the user interface provided by the manufacturer(HP, SONY, DELL, GATEWAY, EMACHINE and soon many other) remains as a cover over the actual operating system. Maybe if the interface was a option for the user to enable or disable, for example the interface is a launcher. You can choose to either go with the basic OS launcher or the Manufacturer launcher. This will give the consumer the ability to choose which they want to enjoy. This way both the developers and the consumers are happy. The developers can continue to build and innovative applications for new emerging Android OS and the consumers can choose to use the manufacturer launcher or the Android OS launcher to interact with their devices. Lastly Fragments is not an Android OS killer. If anything it is an Android OS improvement where the developer can actually control the lay out of their application better and provide a more pleasant interface as needed. Well said! From what I've understood, ice-cream will do wonders for Motorola Atrix type devices. Imagine when docked you could have access to Honeycomb otherwise you'd use Gingerbread with access to the same data. Pretty neat concept. Fragments isn't the killer. Remember iOS 4 launch on the iPhone 3G? AWFUL. Some phones can't handle the newer software because the hardware is definately lacking *cough* Samsung Intercept *cough* I would like to see quicker updates to "premium" devices. The Samsung Epic 4g is still 2.1. For those of us who don't/won't root our devices, we have been waiting a good long while for that update.